United States' Sam Kendricks poses with the U.S. flag after winning the bronze medal in the men's pole vault final during the athletics competitions of the 2016 Summer Olympics at the Olympic stadium in Rio de Janeiro, Brazil, on Aug. 16, 2016. An army reservist competing at the Rio Olympics chose patriotism over the pole vault during the preliminaries. 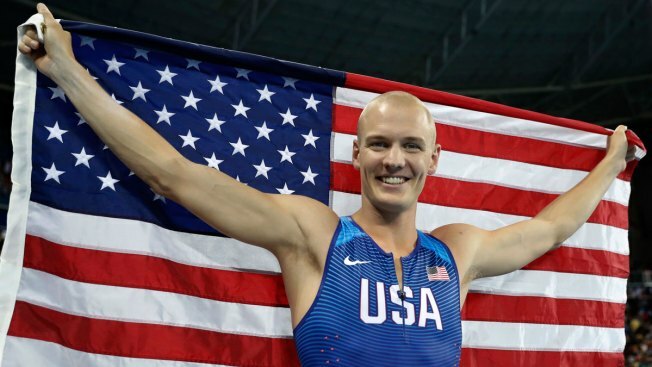 Sam Kendricks was about to attempt the pole vault during the qualifying round last Saturday, but stopped short when he heard the American national anthem being played. He dropped the pole to the ground and stood at attention. As the anthem drew to a close, Kendricks bent down to pick up the pole to take another attempt at the vault. Kendricks, 23, finished first in the preliminaries and won a bronze medal with a 5.85-meter jump. He was a member of the Old Miss Army ROTC program, according to his bio on NBC Olympics. He won the U.S. championships in 2014 and 2015 and also won a silver medal in the 2016 World Indoor Championships.